As it turns out, the chair seat recovering is slightly addictive. And while I still haven't gone back to Goodwill to see if those chairs are still available (unlikely, but there might be more) I did decide to go ahead with a project that I've had in mind for a couple of weeks that involve our dining room chairs. We've had the same dining room set since the winter before Briton was born. At some point that year we decided to use the brief few months while we were both employed (Will was in his first paid internship and I was teaching) to buy ourselves some decent furniture. The idea being that it would be a long time before we could afford it again. And we tried to find things we really liked. For the most part we were successful. We've hung onto just about everything we picked out that year. Sure the big pub chair is in the basement for Will to lounge on between projects and the coffee table cubes were recently retired to the basement as well, but the big stuff, the couch, the dining room table the chairs, have hung on with us all this time. Hanging on is kind of the key word here. Oh, nothing is in too shabby of condition, but the leather couch has some weird dents from where a crate sat on it during our time in Ireland when it lived in storage, the table has some ding marks that were not part of the original "distressed" style" and the chairs, well the chairs are probably the worst off. It's not their fault, they have been hauled between four different cities, five houses, sat in storage for almost two years and been wiggled, shaken and plopped on daily by two energetic kids. It's a miracle that they've lasted so long. In fact, it was only a few weeks ago that Briton and one of the chairs engaged in a major battle with Briton being the victorious (chair now in basement in possibly unrepairable condition). Part of me would like to replace the chairs. I still love the table, but I'm not as into the matchy matchy thing that I once was. I'd like something funky and oddball to replace them but since I haven't come across anything that I really love that wouldn't also break the bank, I decided instead to give them a little make over. 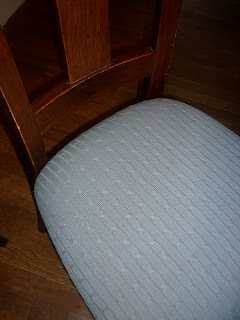 If you've never recovered a dining room chair, here's the thing; it's dead easy. No seriously. The only reason mine have stayed the same so long is that we kept moving and just about the time I'd decide on a color to recover them in, we'd be off to a different house and a different decorating style and leaving them black just seemed smart. Until the seats started cracking, and until we moved into this house and decided we have no plans to move for at least 6 months (just kidding, longer than that! At least 8 months :)) But really, it is easy, and even if you choose an expensive habit, most chairs need so little fabric that it's pretty cheap project too. In fact, I only spent $7, but that's because I decided to use recycled sweaters and it was half price day when I bought them. ( I actually bought 4 different sweaters thinking the broken chair might just be fixable, sigh). To figure out how much fabric you need, measure across the widest part of the seat and around the edges, then add a good five or six inches for luck and overhang. 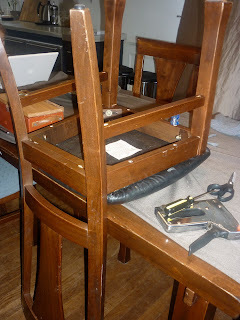 Then measure the length of your seat, again, counting the edges and adding some extra. For most dining room style seats I would guess you could get two seats out of a yard of fabric. But that's just a guess. 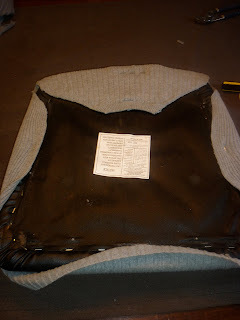 Once you have the fabric, you need a staple gun and staples and probably either a screwdriver or a wrench, depending on how the seat is attached. First though, if you are a professional upholsterer or something like that, stop reading now, I'm sure I'm not doing it the "correct" way, but it's always worked for me, so I'm just going to keep doing what I'm doing. To begin, you need to take the seat off your chair. If the fabric is in decent condition, just cover over it. If it's pretty rough you can take it off and use it to cut a pattern for the new cover. I like to put a staple or to in the center of each side. And then pull the corners in, folding and smoothing as I go. And also flipping the seat over frequently to see how things are looking. Once the corners are set, I put a line of staples along the sides, top and bottom, checking as I go that the fabric isn't pulling strangely. At some point we are either going to need to replace the chairs or add something new (we're on the hunt for a pew, so you know, if you have one laying around, send it my way) because we cant get away with just three chairs and Evie's Svan for very long. And whenever we do whatever we decide to do, we may change up the chair fabric again. 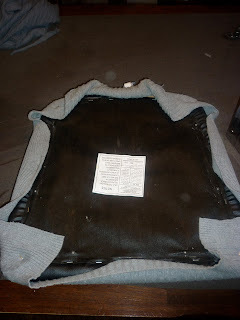 But I'll be rooting for the sweater seats to carry over to the next phase in dining room seating. Makes for some cozy winter dinners! Who knew you could snuggle up in a straight backed chair? Time changes everything, as Thomas Hardy once said. Children grow into adults, seeds grow into trees, mommy blogs turn into a shared writing space between a father and daughter. A challenge for two people to write about the same topic and see where it flies. Humm, Where Did I Read That?